Looking for an old classmate? Just want to reminisce about the good times? Check out E-Yearbook.com and search for your old yearbooks. They have millions of yearbook pictures digitized and they are adding thousands of new pictures every day. They offer the largest collection of old high school, college and military yearbooks on the Internet today. Customers use E-Yearbook.com to search for old classmates, research genealogy, browse a remarkable college sports history archive, greek life records as well as clubs and other content. Save on your registration with e-Yearbook discounts, e-Yearbook coupons, e-Yearbook promotions and e-Yearbook savings found here on 58Coupons.com. Sign up for a yearly subscription with E-yearbook.com and you'll save 50% off the monthly fee. Click link now. If they don't have your yearbook on E-yearbook.com, you can request it. Click link. Register with E-yearbook.com and they'll donate 20% of the fee to their partner schools. Click link to start. 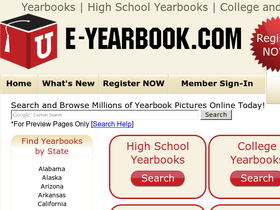 Check out E-yearbook.com and you can search and browse millions of yearbook pictures. Click link to see. Sign-up for $4.95 per month for access to millions of yearbook pictures and much more. Click link for details.